In compiling the Hamlet Historian cricket issue (HH25) we were greatly aided by John Gornall, who supplied us with several anecdotes about his former colleagues. John sadly passed away in 2013, but not before he wrote up his memoirs “so my grandchildren can know where they came from.” The document, titled The Elephant & Beyond is a valuable record for his family, who kindly sent me a copy. The memoirs contain many domestic and occupational anecdotes, including a catalogue of catastrophic injuries, some hilarious, that plagued him in his more mature years. It also highlights the major milestones in his long life, providing readers with a fascinating glimpse into a bygone age. 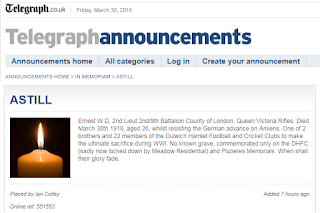 Much of the content, of course, is personal, relating to family and business matters – he worked as a rep for oil giants Shell for many years – therefore we have selected certain portions that might interest our own readership and give us a flavour of the life and character of one of Dulwich Hamlet’s past players. I was born in 1926, to a young couple Lily and John. Lily was a very pretty fair-haired girl of 20, employed as a floor maid of the famous Savoy Hotel. John, a year or so younger, was dark and handsome with a fantastic sense of humour. John was completing his apprenticeship as a monotype setter. Times must have been very hard for this young couple. Lily’s family lived in a very small three-roomed flat, at the military-named Ladysmith Dwellings, Lion Street, Elephant and Castle – a very rough and tough neighbourhood. There were seven flats per floor and these apartments were truly primitive with no running water or toilet within the flat. These facilities were available on the communal landing, with three WCs and two large sinks served by three cold water taps, with communal dustbins beneath. Heating of the flat was by three open coal fires with the coal box housed in one of the bedrooms. Lighting was by gas mantles. The luxury of a hot water bath was obtained at the Manor Place Public Baths for tuppence, which included the use of a towel and soap. Laundry facilities for the seven families were available in a communal wash house on the flat roof of the apartment block where a ‘copper’ was used for heating up water before it was transferred to wooden tubs, for the washing to be completed. As was the practice in those days, families invariably lived in homes adjacent to each other; consequently my mum and dad took a one-roomed flat at 42 Ladysmith Dwellings. The rent was 4 shillings (20p) a week. Local pubs included The Weymouth Arms and The Railway. Both pubs sported their own darts, dominoes, shove ha’penny and crib teams. The Weymouth was a little unique in as much as they had a successful Sunday morning football team for whom my dad played. Before marrying, dad had been given a trial with Tottenham Hotspur but family pressures were brought on him to complete his apprenticeship. Who knows, he may have become another Stanley Matthews – certainly in my young eyes he was the best winger who ever played. I became the team mascot, resplendent in my own complete strip of team colours. I well remember when The Weymouth won the cup. The charabanc did a trip of honour round the local area, with yours truly sitting on the roof of the coach, helping to hold the cup. My dad was obviously a talented sportsman in his youth – story goes that, soon after he was married he had his last fight as an amateur boxer at the Holborn Empire, a variety theatre. Nevertheless at that time, a famous fight manager, Ted Broadribb, tried to get him to turn professional but Nannie Gornall sent Broadribb on his way. We played street games like cricket with a lamp-post as wicket, football with a ball made of old rags packed tightly together and tied with string, hopscotch, skipping and knock down ginger – all in the streets virtually devoid of motorised vehicles, and only the occasional horse and cart going past. The atmosphere at 48 Brandon Street, Walworth, [a later childhood address] was very much like that of a village community – front doors always open, with visitors coming and going. Sunday morning was a routine ritual visit to see our ‘other Nan’ and all of dad’s relations. At the same time we would pick up a few coppers for pocket money. One of the tasks involved was to visit ‘Blind Nannie’ (Great Gran). She would know us by our voices and feel us to see how tall we were growing. She would also be able to know if we were wearing any new clothes. Part of the ritual would be to go to the tobacconist for ‘Blind Nannie’, and pick up half an ounce of snuff before calling at the Jug and Bottle for a half of Old Ale where our great nannie always counted her change closely, recognising the coins by feel. Uncle Harry and Aunt Rose were always good for tuppence, although we rarely saw our cousin Harry [another future Hamlet player] as he was always on a similar trip to see his ‘other nan’. [The family moved to] a large Victorian house in Daneville Road, Camberwell. At the top of Denmark Hill was Ruskin Park, and beyond was Champion Hill, home of Dulwich Hamlet Football Club, a magnificent stadium with the most successful of amateur clubs during the 1930s. They became known as the Arsenal of the amateur world and little did I know then what a great deal of my future would be linked to this club! Arrangements were made for me to travel to Newington Junior Mixed School, which was back at The Elephant & Castle. I enjoyed life at Newington Juniors and we became the primary school of the area in respect of football playing in spectacular yellow and black striped jerseys and hooped stockings. Boxing was another activity that we took part in and Tommy McGovern was a product of the school who, soon after the war, became lightweight champion. I took part in school boxing and eventually reached the finals of the South London Schools, only to be beaten by Stan Davies who, being a neighbour of my ‘other nan’, came in for some verbal stick after leaving me with a couple of thick lips. Stan, too, became a post-war British champion but had to relinquish his title when a medical examination revealed a thin skull. I remember that we were always smartly attired with new clothes being traditionally bought at Christmas and Easter time. A vague memory stays with me regarding a new Christmas suit – It was on the Boxing Day that I was wearing the new suit and out to play with a football which was part of my Christmas present. Needless to say, the football was kicked into a basement of a house surrounded by spiky railings. When I went to retrieve it the railings went up the leg of my new short trousers and split them assunder. I didn’t go home to mum and dad but went to nannie and grandad who helped to see me through the crisis. The world seemed to me to be a happy place – England were winning all their football matches; we had passed through the problem of body line bowling with the Australians, and Arsenal were the team of the decade. Although most of my contemporaries were Millwall supporters and dad had taken me to The Den, I was an Arsenal man at heart. Little did I realise then that I would, one day, play at Highbury. I had taken the ‘11 Plus’ Exam and Southwark Central was my school from September 1937. An enormous influence on my future life was determined at that time. My form master was NFB Dorey. It only became apparent in later life just how advanced was Dorey’s thinking and activity – he was totally dedicated. At the time we were only two years away from total world war, however in that first two years at school an important part of my education and attitude to life was formed almost entirely due to Fred Dorey. School football and cricket were dominating my every activity. From house matches to school matches and South London games, it was all part of growing up with the great sporting Dorey behind us all the way. A great disciplinarian, he brought pressures to bear in every direction, but always true sportsmanship and honesty was the background to his teaching. At about this time I was picked regularly to play for South London Juniors and our home matches were at Dulwich Hamlet or Nunhead grounds. Jimmy Mears was our school centre-half and he was invariably picked to play in these matches. In fact on one occasion South London had seven Southwark Central boys in the side. My dad was a regular supporter of both representative and school matches. He worked in Red Lion Court, just off Fleet Street, for the Monotype Press and was often engaged on the night shift. On Saturday morning I would approach him in his bed and ask for the fare to football. He would always say, “Take it from my trousers.” And off I would go to the match. Kick-off would usually be at 11.00am and somehow or other dad would be on the touchline. I can remember that sometimes after the game he would take me to watch Millwall and this would mean a treat like having lunch at a chop house for chop, chips, peas and a sweet for 1/3 (7p). Mr Chamberlain [the Prime Minister] had been to Munich and the great cry was “Peace in our time.” Sport was still uppermost in the minds of my friends and me. England had suffered at the hands of Don Bradman but Len Hutton had struck a blow for us with his 364 at The Oval. I had been chosen for the West Seniors against the East, to be played at The Oval – my first match on the county ground. All the boys playing were at least two years older than me. Jack Lewis scored 99 for us and Tom Coleman took 5 wickets. I kept wicket and featured in a South London Press cartoon with my head appearing between two giant pads. A memorable day with one significant happening that has been treasured by me throughout my life. Before the game started all the other boys were changing into smart cricket gear taken from large sports bags and I was possibly feeling a little inadequate when Dad arrived in the dressing room with a small parcel and said, “You have forgotten your cricket sweater.” I flustered but accepted it – I had never had a cricket sweater and he had bought it for me that morning, spending his week’s pocket money in the process! A great man! 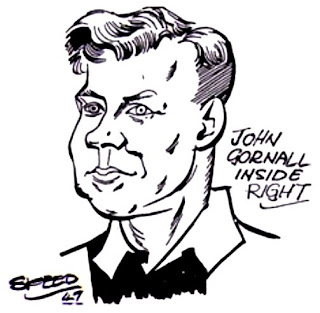 [In the early months of the war Fred Dorey persuaded the Gornall family to allow John to be evacuated to the Devon.] It transpired that Mr Dorey had found me the last billet available in Starcross. I was kitted out with new school raincoat, shoes, etc., and such items as pyjamas that I had not had prior to this time. At the age of thirteen I was off – Waterloo to Exeter armed with enough sandwiches and apples to last a lifetime. Mum was tearful as I was travelling alone on the longest journey of my life. Fred Dorey met me at Exeter and immediately took me to buy a new pair of football boots, which was his gift for the boy who scored the first 50 in the previous schools cricket season. Fred Dorey made arrangements with a local farmer to set up a field for football and games – he got a local contact to provide timber and build goal posts. Also in the outskirts of the village was a boy’s reformatory school – they had a pitch and we played matches against them. 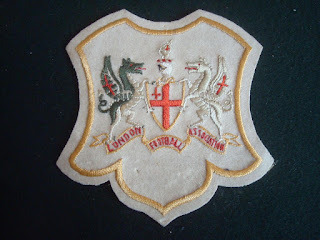 In June 1942 I was introduced to Dulwich Hamlet Cricket Club, and eventually to the football club. Through the influence of the Junior Team manager, Tom Warley, I got a job with Gordon & Gotch as a junior clerk in the advertising department for £1 a week. One got used to the wartime activities and sport was the main activity that kept me going. It was training with the Hamlet for football on Tuesday and Thursday evenings, with matches for the Hamlet on Saturday and an engineering company called Sullivan’s on Sunday. Sullivan’s had a few Hamlet youngsters playing for them and a couple of Millwall players who were exempt from National Service because of their engineering jobs. At 17 years of age I made my debut with Dulwich Hamlet FC. Summer was net practice on Tuesday and Thursday, then playing for Surrey Colts on Saturday and Dulwich Hamlet Cricket Club on Sunday. All the Surrey Colts matches were played at top Surrey club grounds. All these clubs used the Colts’ matches to support the War Savings campaign and often we would have over a thousand spectators at these games. In September the Colts would play a Lords XI at the home of cricket. The Lords XI would invariably turn out a strong selection sprinkled with test match players like Gubby Allen, Jim Sims, Ian Peebles and test match players of the future like JB Carr of Derbyshire and Trevor Bailey of Essex. In 1944 I volunteered for the Royal Navy and joined up five days after my eighteenth birthday. Two or three weeks after arriving, I was moved to HMS Ganges at Shotley in Suffolk for initial training. I immediately got into the Ganges cricket team. A lot of the players in the team were Physical Training Instructors and knew the players of Dulwich Hamlet FC. They were people like Reg Saphin, Chester Brooks, Bill Wood and Tommy Parker. Reg turned pro with QPR when demobbed, as did Chester for Arsenal and Bill for Millwall. Tom Parker captained Ipswich Town from the 3rd Division to the 1st Division and contacted me when I was demobbed, to offer me terms at Ipswich. The wages back then were only paid for the winter and I was earning more money than was being offered, so I remained an amateur and played my entire career for Dulwich Hamlet. [Johnny’s wedding to Joy was originally booked for August 1951, but during the Hamlet’s Easter Tour in Cornwall in March he developed a serious case of pleurisy. This lasted for months and caused the postponement of the wedding until December.] At that time I was working for engineering company Matthew Hall and it had been a disappointment to me that, as a result of being hospitalised, I had been taken off a position which was a three year contract in Jamaica. Joy, who was working for Woolworths at the same time, had also been promised a job in a newly opened Woolworths in Kingston, Jamaica. All the players who had played that day turned up at the wedding in the evening. Syd, the best man did a magnificent job collecting a pound from each of the players – enough for each pound to buy a crate of 24 light or brown ales. There were so many crates that the party continued back at our house until the early hours of the morning. So began our married life. We had a five year plan. As we had no capital we planned to save enough to buy our own house and then to start a family. Joy was enjoying her new social life with me, having met all my Hamlet friends. In 1954 I was playing football for The Hamlet at Woking and received a serious knee injury – I had the cartilage removed and was back playing the following season. Eric Mulley, an England selector, told me I was being scouted. However, playing against Wycombe Wanderers I had another knee injury which finished my football career altogether. One memorable sporting week I remember was before I retired from football – It started on an August bank holiday. On the Saturday, playing cricket for DHCC against Brit House, I scored a century, on the Sunday I scored a century against Norwood CC, and Monday saw me score a century against Linden Park CC. The following Saturday I played for DHFC first team and scored a goal and on the Sunday I scored a century against Barclays Bank CC. One September morning in 2011 [John aged 85] set off for Devon to the Ashbury golfing hotel at Oakhampton. After two holes I overturned the buggy and suffered a serious head wound and bruising. An ambulance was called and I was taken to Exeter Hospital. We got to the hospital at about 5pm but it was standing room only in the Accident & Emergency Department. Eventually the doctor started to sew me up at about 7 o’clock. Martin [his son in law who was also injured] watched the whole procedure and I was glad that he was able to converse with the doctor as I couldn’t hear because my ear was full of blood. It transpired that I had severed an artery in my head which had to be sealed before he could sew up the wound. Martin told me that it was very difficult because the blood was spurting out all the time. All I was able to see was blood all over the towels looking like the inside of an abattoir. Eventually the artery was sealed with eight stitches; it then took another nine stitches to seal the wound. I was still compos mentis and timed the job to be just over one hour. The doctor’s name was Rennie and I thanked him for his patience and concern. The staff nurse put a pressure bandage on my head. I looked like the invisible man. A taxi was ordered and we gave a lift to a lady who was staying at the Manor House Hotel next to our complex. She was in her sixties and had fallen off a horse, which, she said was the first time in her years of riding. I told her she should be more careful at her age! We are extremely grateful to Lisa Gornall and her family for allowing us to reproduce this selection from her father’s memoirs. In November 2017, when we published “For Freedom” which told the stories of the four men who appear on the Dulwich Hamlet Second World War Roll of Honour, it was known that there would possibly be some gaps in the players’ wartime biographies. This certainly proved to be the case with Eric Pierce, who was killed right at the start of his senior playing career. This was understandable for many reasons, not the least of which was the sporadic production of wartime football programmes and the patchy coverage afforded to the game by the local press, which invariably had bigger stories to chase than amateur sport. However, we could only go by the information available to us and there was no reason to believe that the Roll of Honour itself was incomplete. I was therefore genuinely surprised when information came to light after publication of the book which suggested that a further two players had been entirely omitted from the memorial plaque. Whilst Charles Ede had admittedly left the club some considerable time before his death and had perhaps been deliberately ignored for that reason, Alan Adams was still very much a current playing member of Dulwich Hamlet FC when he was killed on active service, a fact that had been reported by the club at the time in an official match programme. Unless the Football Committee of the time was responding to a specific request from Alan’s family not to include him for some now unknown reason – which admittedly would seem unlikely – it does seem that at least one of these two men was overlooked when the club’s war memorial was rededicated following the end of the Second World War. Following some diligent and persistent initial digging by Ian Colley, who first alerted me to this potential oversight, I have been able to glean some further information and now hope to belatedly pay tribute to these two hitherto forgotten men. 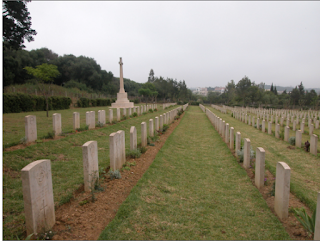 Buried: Dely Ibrahim War Cemetery, Algeria. Charles Ede was born in Croydon on 9 May 1911 to parents Harry and Eva Ede. His father was a removal contractor who ran the family removal and storage business, whose vehicles can still be seen to this day on the streets of South London and Surrey. Charles was a forward who played on the right hand side of the pitch and joined the Hamlet as a junior, during which time he also represented Surrey at junior level. He broke through to the Reserve Team during the 1929/30 Season and scored four times in twelve appearances during that campaign. Ede’s goal scoring record suggests that he was a decent enough player in his own right but as far as his Dulwich Hamlet career was concerned, he had the misfortune to play at the same time and in the same position as the legendary Edgar Kail, so opportunities for First Team football were somewhat restricted and largely limited to appearing whenever the great man was injured or absent due to representative duties elsewhere. During the 1930/31 Season, Charles scored nineteen goals in sixteen appearances for the Reserves and also appeared for the First Team in a 2-2 draw at Tufnell Park, in which he scored both of the Hamlet goals. His next recorded First Team appearance is in the programme line-up for a Boxing Day friendly in the 1931/32 Season versus Swindon Corinthian, which Dulwich won 5-0, although we do not currently know whether Charles featured on the scoresheet. Another First Team opportunity for him came towards the end of the same season, on 23 April 1932 in a home Isthmian League game against Oxford City, which came exactly one week after the Hamlet had lifted the FA Amateur Cup by defeating the famous Crosby based club Marine 7-1 in the Final at Upton Park. The programme for the Oxford match promised supporters that “The Cup will be taken around the ground today at half time” but whilst Edgar Kail was listed in the printed team line-up, in the event he did not play. The Amateur Cup Final had been played on a heavy, muddy pitch on which perhaps he had picked up a minor injury that was felt not to be worth risking in an end of season match. Whatever the reasons for Kail’s absence, Charles duly understudied for him in a game which the visitors comfortably won 3-0 and which was clearly a case of “After the Lord Mayor’s Show...” as far as the home side were concerned. Incidentally, Edgar Kail returned for the following match, a 6-1 thrashing of Clapton! Incidentally, some three months earlier, Ede had played outside right for the reserves in a 10-1 victory over the same opposition. In total, Charles made eleven First Team appearances during the 1932/33 Season in which he scored seven goals, as well as scoring a further seventeen times for the Reserves. Charles went on to make 43 appearances for the Ks and scored 20 goals for them during his time there but left at the end of the 1934/35 Season, at which point he seems to disappear from the footballing map. Charles married Ellen Elizabeth Copeland on 29 August 1936 at St Anselm Catholic Church, Balham High Road and the couple settled down to live at 17 Netherfield Road, Upper Tooting, where they were still living at the time of the declaration of war three years later. In the 1939 Register, an emergency census taken shortly after the outbreak of war, Charles described himself as a Periodicals Editor with the entry containing an enigmatic note “Food and Teaplate” alongside the job description. If this refers to the name of a magazine, we have so far not been able to establish the existence of any such periodical of this title, although being a full-time journalist and editor could possibly be the reason why his footballing career was curtailed. Charles then attended a course of instruction as a Muster Clerk and duly qualified on 15 April 1942, at which point he was promoted to Bombardier and transferred to Headquarters, 45 Light Anti-Aircraft Regiment. This regiment was equipped with 40mm Bofors guns for low-level anti-aircraft defence and formed part of the anti-aircraft defence for the important industrial and railway town of Crewe. However, the unit was earmarked to be deployed overseas and on 1 November 1942, sailed from the Clyde on a vessel of Convoy KMF2 bound for Algiers as part of Operation Torch, the joint Anglo-American invasion of French Morocco and Algeria. This operation was designed to squeeze the Vichy French and Axis forces out of North Africa concurrent with the advance of General Montgomery’s Eighth Army from the east following their victory over Rommel’s Afrika Korps at El Alamein. The convoy arrived off Algiers on 12 November, four days after the initial invasion and whilst it had been the original intention to land part of the regiment at Djidjelli (now called Jijel), about 320 kilometres east of Algiers, poor weather and sea conditions precluded this and the entire regiment instead disembarked at Bougie (now called Béjaïa). Algiers itself had quickly fallen to the Allies – the senior Vichy French officer located there had surrendered the city on the same evening as the initial landings – but despite this collapse of their erstwhile collaborators, Hitler ordered German forces to continue to resist the invaders. By 20 November 1942, 45 Light AA Regiment had reached Djidjelli and their twelve 40mm guns were deployed, along with eight heavier 3.7” guns of 72 Heavy AA Regiment to provide anti-aircraft defence for the Allied aerodrome which had been established there, with Regimental Headquarters located nearby. The Regiment’s War Diary records that at 20:05 a single Ju88 aircraft approached from between 4-5,000 feet in a low level dive bombing attack. The bombs missed the airfield but caused considerable damage to adjacent buildings, one of which housed Regimental HQ. Charles was initially posted as missing but later the same evening, his body was found beneath the rubble of the building. An officer from the US Army and a further four American servicemen were killed in the town during the same air raid. Charles’s wife Ellen received the heart breaking telegram informing her of her husband’s death on 9 December 1942 and was subsequently awarded a War Widow’s pension of 19 Shillings per week effective from 22 March 1943. Charles is buried at Dely Ibrahim War Cemetery along with 493 other British and Commonwealth Servicemen killed during the Second World War, as well as eleven of other nationalities. 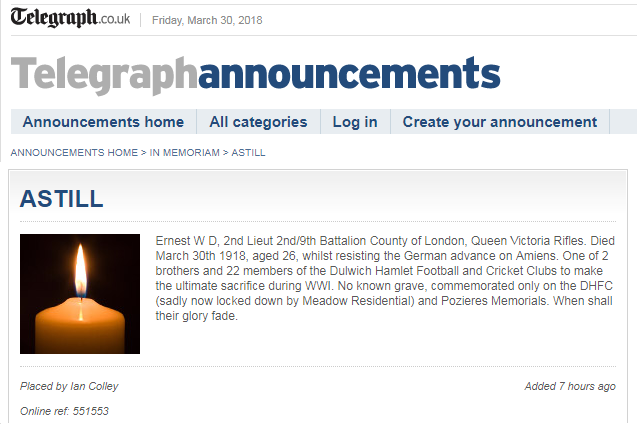 Despite the fact that he had left the Hamlet some eight years before his death, it is to be hoped that we can eventually add his name to the Roll of Honour in order that we can continue to remember his service both to Dulwich Hamlet and to his country. Glider Pilot Regiment, Army Air Corps. Buried: Arnhem Oosterbeek War Cemetery, Netherlands. Our second forgotten man was a local boy born in Camberwell who was to become by far the youngest of our Second World War casualties. Alan Adams was a first generation Londoner, as his parents Richard James and Pyarea Victoria Adams (nee Rhind) had both originally hailed from West Derby on Merseyside. Alan had an elder sister, Patricia, who was born on 13 August 1923 at the former family home at 18 Oban Road in the Walton district of Liverpool but sometime after this event, the family had moved to London and were established at 22 Bushey Hill Road, Camberwell by the time of Alan’s birth on 22 May 1925. The reason for the move south is unknown but could possibly be connected with Richard’s job as an accountant with a steamship company or was perhaps because of a general lack of work on Merseyside at that time. By the time of the 1939 Register being taken shortly after the outbreak of war, the family had moved to 58 Sunray Avenue in Herne Hill but the then 14 year old Alan does not appear in the census. He had become a pupil of Archbishop Tenison’s Grammar School at Kennington in 1936 and had been evacuated out of London with his school to the relative safety of Reading. Alan served with the school’s Officer Cadet Corps but later transferred to their Air Training Corps when this was established in 1940 and so appears to have taken a keen interest in the military from a young age, as well as perhaps having an eye on a future career as a flyer. Alan was also an accomplished sportsman who represented his school at athletics, cricket and football – the latter two at First Eleven level. Alan left school in mid-1941 and returned to live at the family home in Herne Hill, from whence he took up a job as a Junior Insurance Clerk for the Liverpool Victoria Insurance Company. Alan’s military life continued after leaving school, as he served in his local Home Guard Unit, the 18th County of London Battalion which was based at Lordship Lane, from 1942 pending his enlistment into the Army proper. It was whilst serving with the Home Guard that the then 17 year old made his senior debut for the Hamlet on Saturday 7 November 1942 at Champion Hill in a 4-4 draw against the London Fire Force. Ironically, despite the match being played at Dulwich, this was in fact an away fixture for the Hamlet as the Fire Force also used the ground for their home matches – such oddities were not entirely uncommon in wartime football. Alan didn’t feature on the original team sheet but the following week’s programme explained that he had been a late call-up due to the regular left back Roger Bishop being detained at work and unable to reach Champion Hill in time for kick-off. 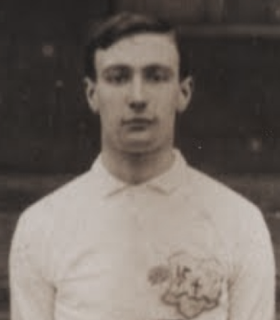 Dulwich fielded a youthful team and in addition to Alan, there was another debutant on display, a young centre forward by the name of Charles Birdseye, himself a late replacement for Stan Smith who was suffering with influenza. Birdseye made an instant impression by scoring one of the goals during the Hamlet’s spirited fightback from 1-2 down at half time. 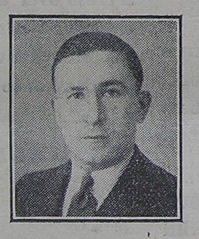 Arthur Phebey with two and Gillespie were the other scorers in a match which the following week’s programme described as “…reminiscent of the peace time days when it was a bye-word that Dulwich Hamlet always played their hardest when up against it.” This same programme, which was for a match against the RAF on 14 November 1942, went on to say that “….the youngsters mentioned will be heard of again.” so we can only assume that Alan performed well on his senior debut. Alan was attested into the Army and duly swore allegiance to the Crown on 19 March 1943 but his actual enlistment date did not come until the following 6 May. It would appear that previous experience with the school Air Training Corps had hardened Alan’s ambition to become an airman, as after completing his basic training with the Gordon Highlanders, he transferred to the Army Air Corps on 14 January 1944 having volunteered to train as a Pilot with the Glider Pilot Regiment. At this point, Alan was promoted to the rank of Corporal, with a further promotion to Serjeant following on 15 June 1944. He was awarded his Army Flying Badge to signify qualification as a glider pilot on 27 July 1944 and was then posted to E Squadron, No. 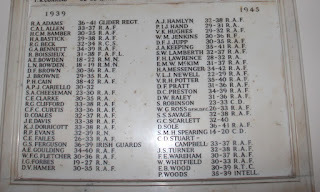 2 Wing, Army Air Corps, where he would fly the Airspeed Horsa glider. These large wooden aircraft could either carry 30 fully equipped soldiers, or a freight load of three tons on airborne operations. The role of a glider pilot was an extremely hazardous one, for not only were they expected to fly the heavily laden gliders into their landing zones through invariably hostile skies but upon landing, they were then expected to fight as infantrymen alongside the airborne troops they had just transported, until such time as they could be evacuated out of the landing zone back to friendly territory. The photograph that illustrates this article shows a young pilot wearing civilian clothes rather than Army uniform – this type of photograph was taken in case a false identity was required to smuggle the glider pilots from behind enemy lines following airborne operations and further demonstrates the precarious nature of the glider pilot’s life. Whilst we are not absolutely certain that the photograph (which was kindly supplied by Dutch military historian Luuk Buist) definitely depicts Alan, we see a hitherto unidentified pilot of E Squadron who is simply described as “Boy”. 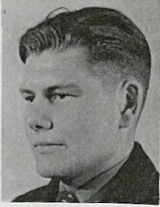 Given Alan’s extreme youth, coupled with his position as the youngest pilot in his squadron, it must be a fair assumption that this is him, especially as the physical description given on his Army service record “fair complexion, grey eyes and brown hair” matches that of the person in the photograph. In September 1944, Alan’s Squadron was required to take part in Operation Market Garden, Field Marshal Bernard Montgomery’s bold plan to seize the bridges over the River Rhine and thrust directly into Germany. Had everything gone according to plan, the war could perhaps have been considerably shortened but for a variety of reasons too complex to go into in an article of this nature – a mixture of over-optimistic planning, poor weather, missed opportunities and intelligence failures – the operation went down in history as one of the “glorious failures” of the war which is still hotly debated amongst military historians to this day. 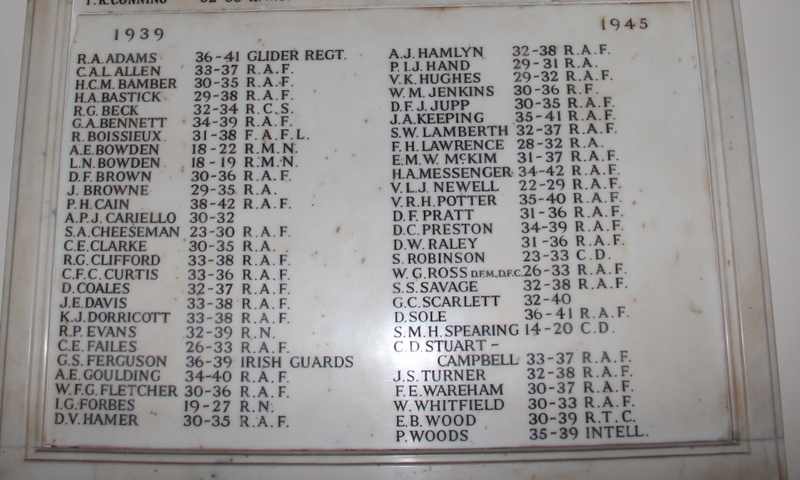 On 18 September 1944, as part of the Second Wave of landings, the Horsa glider piloted by Alan, which was chalked “837” left from RAF Down Ampney in Gloucestershire, towed by a Douglas Dakota transport aircraft of 271 Squadron RAF. Alan’s glider carried a heavy load of a Jeep plus two trailers full of ammunition as well as two passengers from Headquarters, 1 Airlanding Light Regiment, Royal Artillery. The Second Pilot on board was Serjeant Richard Ennis from Wallasey on Merseyside who thus had something in common with Alan, whose parents were both originally from that part of England. The flight initially went according to plan but shortly before 20:00 when approaching the Landing Zone at Wolfheze, Alan’s glider was taken under fire by German anti-aircraft guns and a flak shell burst close to the glider’s starboard wing. Alan was hit by shrapnel and slumped in his seat over the controls, at which point, the Second Pilot Serjeant Ennis took over. Unfortunately, he could not recover full control in time and as a result, the glider overshot the Landing Zone and ploughed into trees at over 100 mph. Ennis was catapulted through the Perspex windscreen whilst still strapped into his seat but amazingly survived more or less unscathed, as did the two Army passengers in the rear. Sadly, Alan was crushed by the load behind him which shifted forward with the impact of the crash. 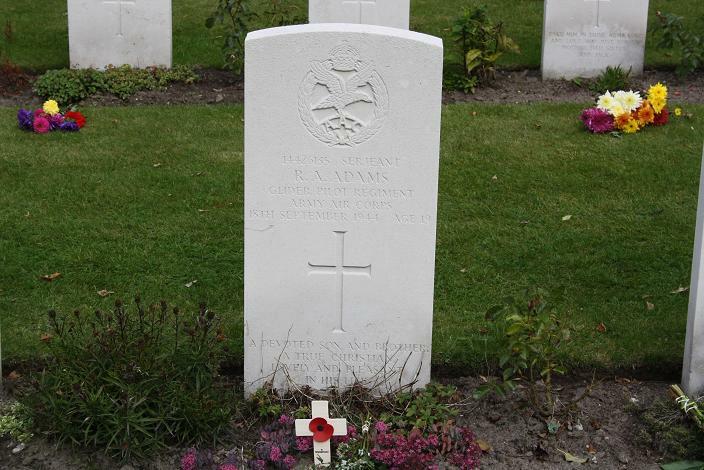 At first, he was given a field burial in a garden behind the Psychiatric Home at Wolfheze but on 24 August 1945, as part of the general peacetime consolidation of British and Allied war graves in the area, he was re-interred at Oosterbeek War Cemetery, which contains the graves of 1,691 British and Commonwealth servicemen as well as a further 79 Polish and three Dutch servicemen. Whilst the death of Mrs Pyarea Adams was undoubtedly a great tragedy for the family, the circumstances of her death as described in the Hamlet programme do not stand up to scrutiny. The 1939 Register recorded that Alan’s parents both served as Air Raid Wardens within the Metropolitan Borough of Camberwell, which could lend credence to the “enemy action” theory but inspection of Pyarea’s Death Certificate reveals that she died at the age of 43 on 19 February 1944 from “Cardiac Asthma” at home in Sunray Avenue. Although there was indeed an air raid on the day of her death, the family home was not bombed and neither were any fatalities or injuries recorded elsewhere in the immediate area. The mystery is further compounded because she is not recorded by the Commonwealth War Graves Commission as a Civilian War Death, which would have been the case had she been killed as a direct result of an air raid. Whilst the stress of working as an Air Raid Warden during the London Blitz would undoubtedly put a great strain on a weak heart, it would appear that Pyarea did, in fact, die of natural causes. There is also some confusion regarding Alan’s Christian names; his Birth Certificate records him as Richard Alexander Adams, whilst his Army service record and that of the Commonwealth War Graves Commission show him as Richard Allen Adams, although Archbishop Tenison’s Grammar School’s obituary in December 1944 gives his name as Ronald Alan Adams. 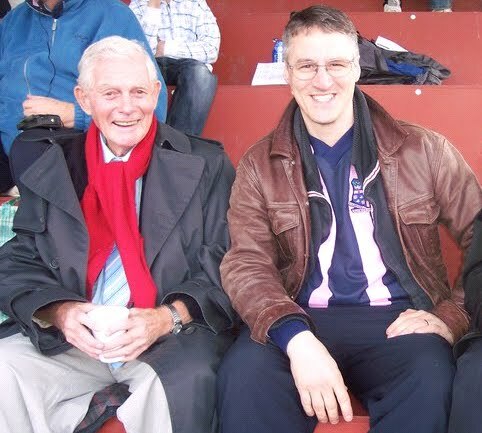 To compound matters further, Dulwich Hamlet programmes and the “Tenisonian” yearbooks refer to him simply as Alan Adams. 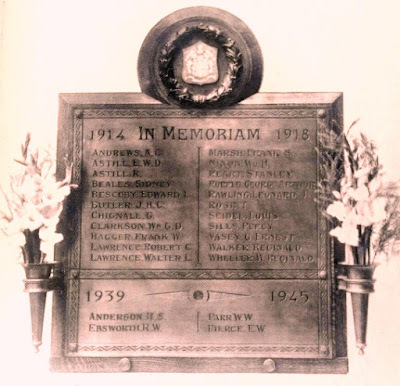 However, the details concerning his Army records, parents, schooling and home address leave us in no doubt that despite the various permutations of his name, these all refer to the same man mentioned in the Dulwich Hamlet programmes, who should belatedly be commemorated on our Roll of Honour. Quite wrong to do so. 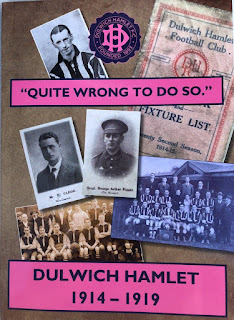 Way back in 2005 the Hamlet Historian magazine dedicated an entire issue to Dulwich Hamlet Football Club during the First World War. Mishi Morath, Roger Deason and I scoured countless newspapers and war files (mostly on microfilm) attempting to piece together an accurate record of matches played and particulars of the war casualties. We did a good job. It was certainly one of the most remarkable things the magazine ever did. It was in this issue (HH14) that Roger produced an article entitled “When Shall Their Glory Fade?” which directly led to his book of the same name some years later. Among the many fascinating things Roger uncovered was a mistake to Edgar Bescoby’s name on the War Memorial at Champion Hill. We felt there was a real necessity to make the correction, and at the unveiling event on Remembrance Day the same year Roger gave a magnificent speech detailing the lives and tragic deaths of the Hamlet fatalities. With the discovery of the Fred Pilkington collection of programmes and ephemera a couple of years ago, including several issues of the News Of The Pink And Blue Brigade wartime news sheets, Roger Deason was able to gain further details. He has since followed up his studies of that era and produced a new book called “Quite Wrong To Do So”. Although it has been available for purchase for some months it is now getting a relaunch to tie in with the 2018 Remembrance Day commemorations. All profits will aid Dulwich Hamlet’s 12th Man Fund. The book is set out chronologically season by season looking at many of the interesting games played against forces teams and local Isthmian League rivals. It highlights some of the characters who represented the Hamlet and “did their bit” for King and Country during exceedingly dark days. A time when the club had its Champion Hill ground given over to army use and was close to going bankrupt. Roger also examines the club’s recruitment drive with the great emphasis placed on all able bodied men to sign up for the war, and the effect it had on the club post-war. The book actually goes beyond the armistice and concludes at the end of the 1918-19 season. 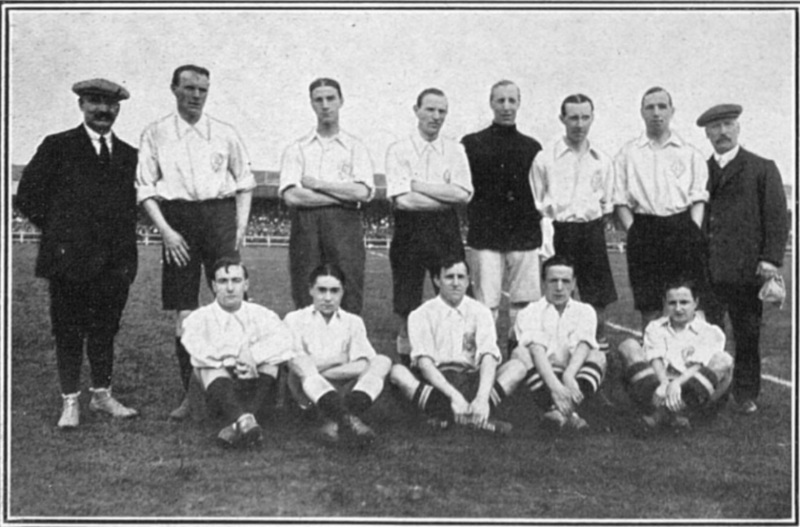 This neatly dovetails into my own The Story OfA Season: Dulwich Hamlet 1919-20 which is sadly long out of print. 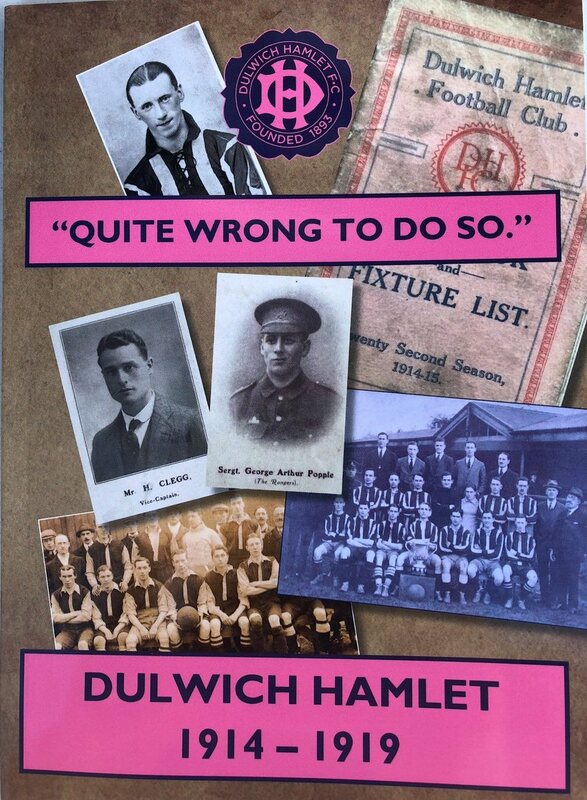 We urge all Dulwich Hamlet supporters to obtain a copy of the fully illustrated “Quite Wrong To Do So”, available at the ground on match days for £6.00. Saturday 22 September 2018 sees Dulwich Hamlet embark on its latest journey in the FA Cup. This year we begin at the Second Qualifying Round of the competition where we face Tonbridge Angels of the Bostik Premier Division. Three wins and it’s the First Round Proper, something that has eluded Dulwich for so many years. Tonbridge Angels’ manager Steve McKimm is no stranger to older supporters of the Pink n Blues. In fact the last time Dulwich Hamlet got through to the First Round he was in the Hamlet team. Sadly that was twenty years ago against Southport. The previous time such dizzy heights were reached was back in 1948, fifty years earlier. McKimm, who signed from Molesey at the start of the 1996/97 season, was a fans’ favourite at Champion Hill. The tough tackling attacking midfielder made 126 appearances for Dulwich over two and a half seasons, scoring 13 goals. His time at Dulwich straddled the Paul Whitmarsh / Willie Lillington strike partnership era and the brilliance of Peter ‘Blobby’ Garland. Unfortunately Garland, one of the finest non-league footballers of his day, was suspended for the tie. Southport won the match 1-0 through a Tony Houghton own goal, but the home side hit the woodwork on four occasions including one shot from McKimm himself. One of the most memorable games featuring McKimm was the 4-1 win over Yeovil Town in which he scored one of the Hamlet goals. The first, titled DulwichHamlet Football Club and Lorraine ‘Pa’ Wilson is a very informative piece about the founder of Dulwich Hamlet. Sharon O’Connor, one of the journal’s regular contributors, has uncovered details about Pa Wilson’s early life that add to our understanding of what made him tick. 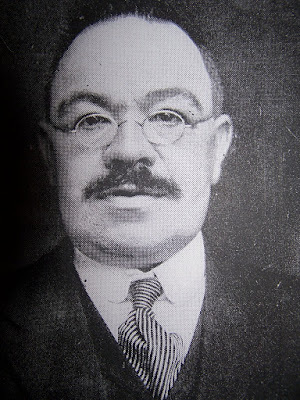 The Hamlet Historian was sourced for the article – originally titled Lorraine ‘Pa’ Wilson (1865-1924): Founder of Dulwich Hamlet Football Club and practical social idealist. This was sent to us a few months ago to confirm some details. In the much longer unedited version acknowledgement was kindly made to us. However, in the printed version the acknowledgement has disappeared altogether. Sharon has since emailed us to apologise for the omission. Her original version, which runs to 2,600 words, was sadly hacked to pieces to fit the quarterly journal. Presumably the missing 1300 words were sacrificed to make way for the editor’s own article about the current situation at Dulwich Hamlet FC. The less said about Green’s piece the better. The HH also provided some excellent photographs but these were discarded altogether. Instead, for reasons only known to the editorial team, they have thrown in a picture of a group of Dulwich Hamlet schoolchildren from 1906!